"This should not be our Super Bowl." When former FishbowlDC editor and Politico reporter, Patrick Gavin, set out to make a film about the White House Correspondents’ Dinner, his initial intent was merely to paint a “portrait” of the dinner. But like the dinner itself, what started off as a simple project became something much grander. Unlike the week long event, however, Patrick’s film wound up looking inward — a critical look at how a dinner originally comprised of 50 White House correspondents and the President seems to have lost itself. 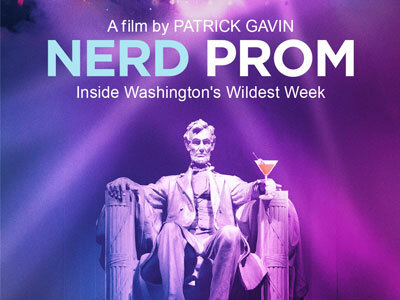 Last night’s screening of “Nerd Prom: Inside Washington’s Wildest Week” at the E Street Cinema was followed up by a Q&A with Gavin, the movie’s writer and director, and radio show host Bill Press. Press’s first question to Gavin was whether he was the right person to be criticizing the dinner, as he use to be a part of the machine that fed silly questions to celebrities and politicians at the WHCD. Moral of the story: there’s nothing wrong with a little partying, as long as we remember what the week is really about… more scholarship money and more love for our White House correspondents. Notable guests included Alexis Simendinger, Andrea Seabrook, Anne Cronin, Annie Groer, Becca Watkins, Benny Johnson, Beverly Kirk, Bill Press, Carrie Sheffield, Carl Cannon, Christi Parsons, Connie Lawn, Daniel Lippman, David Chalian, Dennis Kucinich, Eddie Scarry, Emily Heil, Emily Kuhn, Erin McPike, Garance Franke-Ruta, George Condon, Hadas Gold, Howard Mortman, Janet Donovan, Jeff Dufour, Joe Curl, Karl Frisch, Kenny Day, Kimball Stroud, Kyle Volpe, Lee Brenner, Manuela Cavalieri, Matt Dornic, Matt Sobocinski, Meredith Merrill, Michael Schwab, Olivia Petersen, Peter Mirijanian, Ryan Grim, S.E. Cupp, Sean Spicer, Steve Thomma, Sue Davis, Tareq Salahi, and Tommy Christopher.